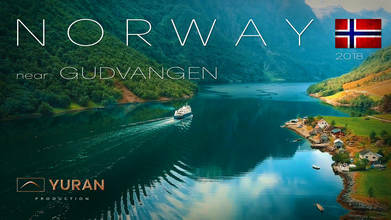 Check out this magnificent drone video from the fjords of Western Norway, compliments of contributor YURAN. The town is located at the end of the Nærøyfjord an 18 km (11 mi.) long but extremely narrow fjord in Sogn og Fjordane County. Nærøyfjord is an extremely populat tourist destination and it's listed as a UNESCO World Heritage site. The fjord is actually a branch of the Sogn og Fjordane, otherwise known as the King of the Fjords for being the country's largest. Description: NORWAY near Gudvangen 2018. Short film from drone DJI Mavic Pro. Cinematic 4K short film from drone about place near Gudvangen in Norway. Director and music - Andrii Yurlov. DJI Mavic PRO.